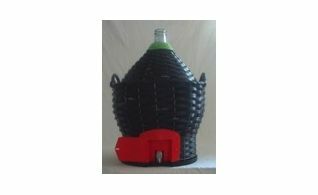 Musca Wine Pressing & Supplies offers a wide variety of sizes, styles and materials for demijohns. A 10 Lt. demijohn protected by a plastic basket for easy carry. A 15 Lt. demijohn protected by a plastic basket for easy carry. 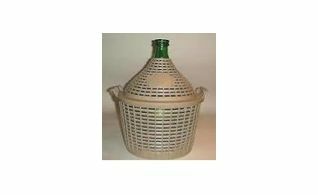 A 20 Lt. demijohn protected by a plastic basket for easy carry. A 25 Lt. demijohn protected by a plastic basket for easy carry. A 34 Lt. demijohn protected by a black plastic basket for easy carry. 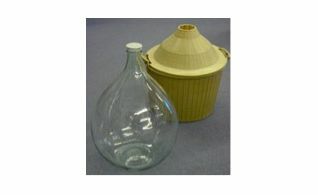 A 5 Lt. demijohn protected by a plastic basket for easy carry. 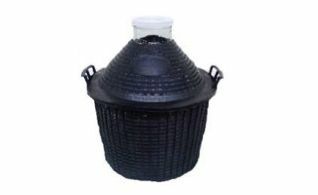 A 54 Lt. demijohn protected by a black plastic basket for easy carry. 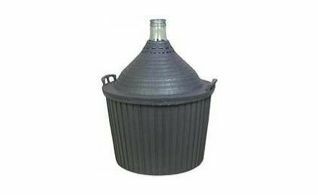 Demijohn Plastic Basket 54 Lt.
A 54 Lt. demijohn with a removable plastic basket for protection and easy carry. Demijohn Wide Mouth 34 Lt.
A 34 Lt. wide mouth demijohn with a removable black plastic basket for protection and easy carry. Demijohn Wide Mouth 5 Lt.
A 5 Lt. wide mouth demijohn with a removable black plastic basket for protection and easy carry. Demijohn with Tap 34 Lt.
A 34 Lt. demijohn with tap and protected by a black plastic basket for easy carry. Demijohn with Tap 54 Lt.
A 54 Lt. demijohn with tap and protected by a black plastic basket for easy carry.